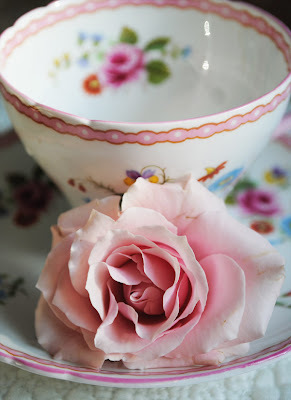 Artful Affirmations: Tea Cup Tuesday-Pretty Pink! 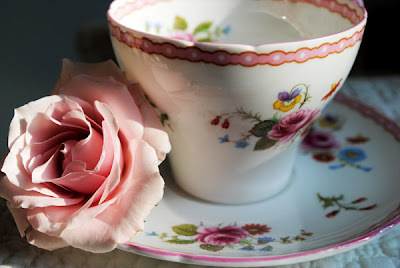 Hello All and Welcome to Tea Cup Tuesday, where my dear friend Martha and I share a cup or more that we love. I don't know why I am so thrilled with tea cups....I have felt this way since I was barely 20 years old, and I still feel the same way. I love picking out the tea cup I am going to use. I walk to one of my china cabinets and gaze at all the lovely pieces of china in there....then I pick my favorite of the moment. I am an equal opportunity cup owner, every cup gets used! Today I am sharing a sweet cup that I bought on eBay. I really love the colors in this cup and it's plain pink handle. The pink trim around the outside and inside edge is so quaint...and the poesy of flowers inside is really pretty too. I would have called this a corset shape, but on a Shelley page I found it and it is called the New Cambridge shape. I did not know that before! Did you? Is this correct? The cup lip and the plate edge have a sweet scallop design. I normally wouldn't like orange flowers with pink roses, but somehow on this cup it works. This backstamp shows that it is a Shelley, made somewhere between 1945-1966. Here is a great page that shows Shelley backstamps. 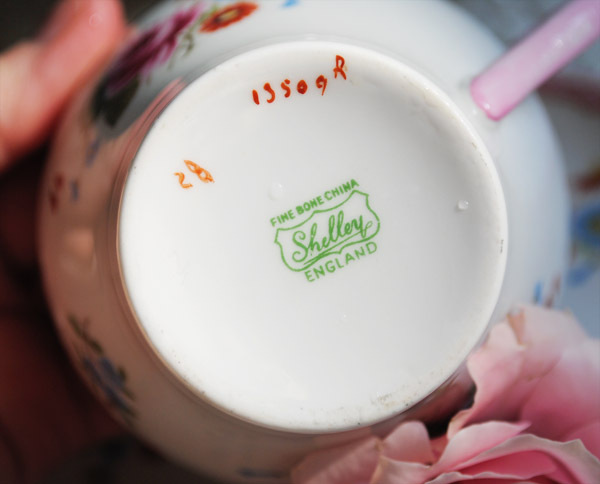 The Shelley comany is well known for it's very fine china. The Dainty cup shape is their most famous. I also would like to share with you a little tea pot I found. It is about 5" tall and fairly heavy. I think that is a W engraved on the front. I bought it because I found the shape and weight pleasing and it was only $8. 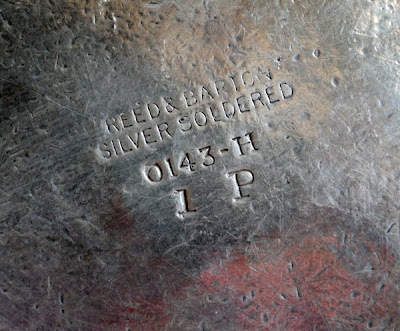 Here is the backstamp, and it is Reed and Barton. I do not know anything about these kinds of wares, and if you do, I would love to know anything you can tell me about it. I was recently in a Matchbox Swap at Marie Antoinette Mail Art Ning group (my previous post shows two boxes I created). I received a gorgeous box from Debi, filled with goodies! Inside was an extra little gift, all wrapped in pink....and inside was this tea tray! I was so surprised and so delighted! So off it went to Mrs. Rose's bedroom. She lives above her tea shop. She likes a nice cuppa after a long day waiting on costumers. I will be posting another Artist Share this week and I will show you the fabulous box I received from Debi. Thank you so much Debi! Thank you so much for stopping by to visit today. I really appreciate it! If you would like to join in and share one of your tea cups, please create a post with your cup and then come back here and fill in the two blanks below making sure the link goes to your tea cup post. Then we can come and see your lovely tea cup! Hi Terri..oh my..So sweet and delightful!The beautiful roses makes the photos so charming...beautiful! I LOVE the tea pot..that is so me!! Stunning and magical...thankyou for sharing that unique piece!! And lovely treasure..so wonderful..enjoy it! HUgs and happy tea my friend! What a beautiful little teacup Terri! Love how you photographed it! I love that adorable little teapot! What a great find! The teacup is just exquisite! Thank you for hosting our party and sharing tea! Of COURSE I love your Shelley! They are so lovely! The teapot is a dear as well. Thanks for making me smile...in spite of toothache! Terri, I love the new cup. So sweet and dainty decoration. Isn't mail call wonderful? The tiny set is just too cute! The Reed and Barton tea pot is a great find. Happy Tea Day! the tea cup is so dainty and pretty. I appreciate learning new things too. That teapot is a gem! What a delightful tea cup! The pink rose shows it off so well too. The teapot is adorable and how wonderful that you found it! Love the little tea tray. I was also admiring your matchbox in your previous post and I love it! How cute it is and so creative! Thanks for sharing all your pretties and have a lovely week. Oh Terri, your teacup is bbeautiful! 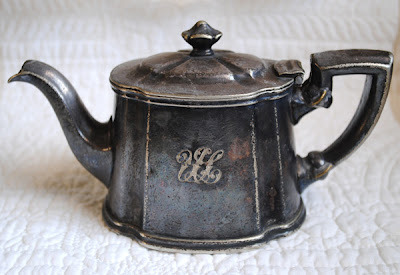 And what a woderful find in that dilver teapot! Gorgeous! Hi Terri what a sweet teacup! so charming! I love the old silver teapot looks quite old. I wonder how old? 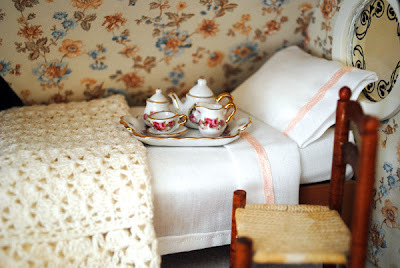 What and adorable little miniature tea set Debi sent you! so cute and I see you had a nice place for it, what a perfect place! Thanks for sharing with us again this week! Please visit me today. Hi there! I too am an "equal opportunity cup owner" and all of my cups get used! That is a part of the fun of collecting them I think. I love your cup, and particularly love the little tea tray - adorable! Thanks for hosting this party - have a wonderful week. ps: have a beautiful tuesday! 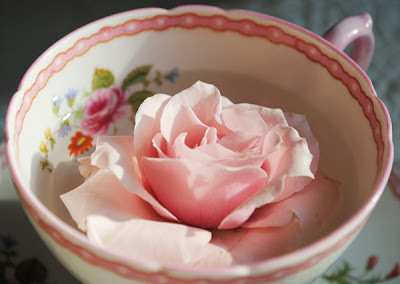 Hi Terri, your little cup is such a beauty- oh how sweet, and delicate-and with the rose inside totally wonderful. I also love the cute little tea,tray-from your swaps- how real M.A.like. first of all I want to tell you that your link on Martha's Blog carried me to your blogpost from last week. But, no problem, that is the way to enjoy two of your tea time tuesdays on one day. I am again enthralled with your lovely Sevres cups, they look as if Josephine de Beauharnais had used them. Today's Shelley tea cup is really delightful, too. The Reed & Barton tea pot is a treasure, it looks so noble. This company exists since 1824 and still produces silverware. Discover their online homepage. I am not so familiar with the shapes and times of this type of tea pots but it looks gorgeous. Thank you for hosting this sweet event. Terrie, My very first teacup Tues.! Wow, a Shelley... It is absolutely gorgeous! So pleased to be a part of this sweet show and tell! See you next Tuesday! Lovely cups! So nice to see such pretty things! Such a pretty tea cup, love its flower poesy inside. What a sweet little tea pot, I love the small ones too. The cup is very pleasing, Terri. I do agree that it has a corset shape which adds to its charm. It seems like a happy cup with lots of personality. Very pretty shape, design, and style. It amazes me that you can make a decision so quickly on which cup to use in the morning, as I would most likely be still standing in front of the cabinet by noon. That little cup is so beautiful and delicate - lovely! Thank you for sharing all of your lovely tea things! The cup is so dainty, and I love the teapot! The tea set in the bedroom is beautiful! I've loved them since my 20's too...what's up with that? lol They are so pretty, and great fun to hunt down and collect from thrift shops too.....!!! Your cup is so sweet especially the way you've place the delicate flower by it...your photos are so sweet! Terri, I love this sweet teacup! The colors are so pretty, and what a fun color combination it is. Your tea pot find is wonderful, it has such a pretty shape. As far as the little tea set, I knew when I saw it, that it was made for you! What a lovely blog you have! Thanks for stopping by my blog! I couldn't comment at all yesterday so I am late and don't know if I will have time to do the rounds as usual. I love the cup and the shape be it corset or the other. The rose is stunning, love that you used it as well. These pictures bring me great joy. Funny how colors do that! 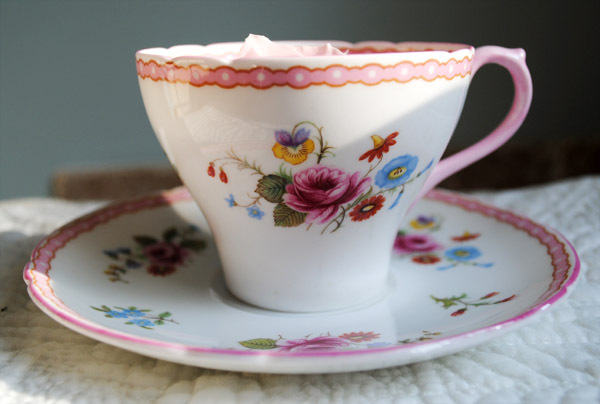 I also was in love with tea cups and remember looking at my mother's collection and getting them out of the cupboard when she was gone. i was eighteen when she died and someone else got them ;-( I would have loved them! I remember that you invited me to put my funny little tea cup set up and I wil. Things are so crazy around here and I forget to plug in the camera battery! That meant a lot to me. 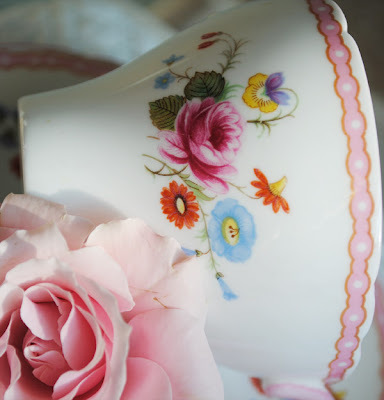 stopped by via another blog - what a lovely blog post and I agree - orange and pink wouldn't normally suit but they look charming on that tea cup! Your photos are so pretty. Beautiful teacup! the colors go beautifully together! The pink rose is gorgeous! Opps Terri, I think I ended up on your # thing twice...didn't think it took it the first time. Anyway, LOVE your teacup. I am so taken by the matchbox exchange...what a fun thing to do. You have such a delightful group of blog friends. I enjoy your posts very much. I love Mrs. Rose's bedroom and your lovely new tea tray. I'm so glad I found your blog!